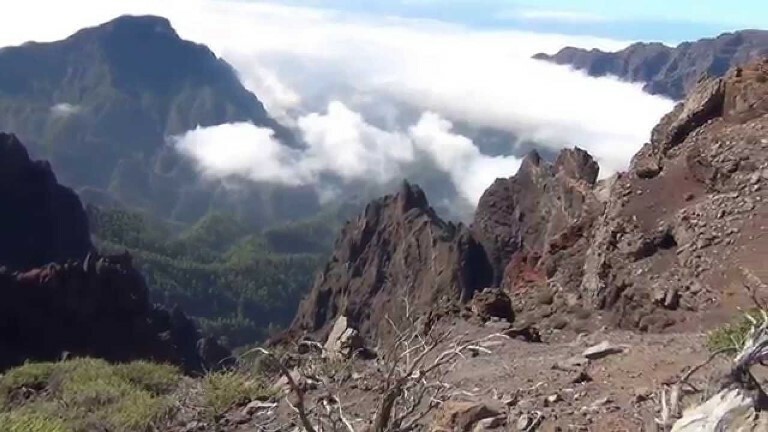 Famous trail round the astonishing collapsed volcanic Caldeira de Taburiente, a vast horseshoe of cliffs, rising approaching 2,000m from the caldera bottom to the rim. 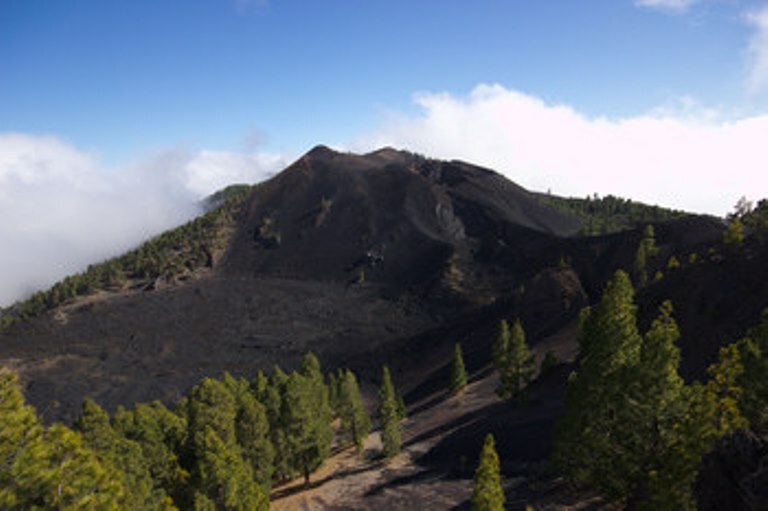 Huge views over the crags and chasms of the caldera, down to the distant sea in one direction, and down through the forests of the flanks of the ancient volcano in the other. 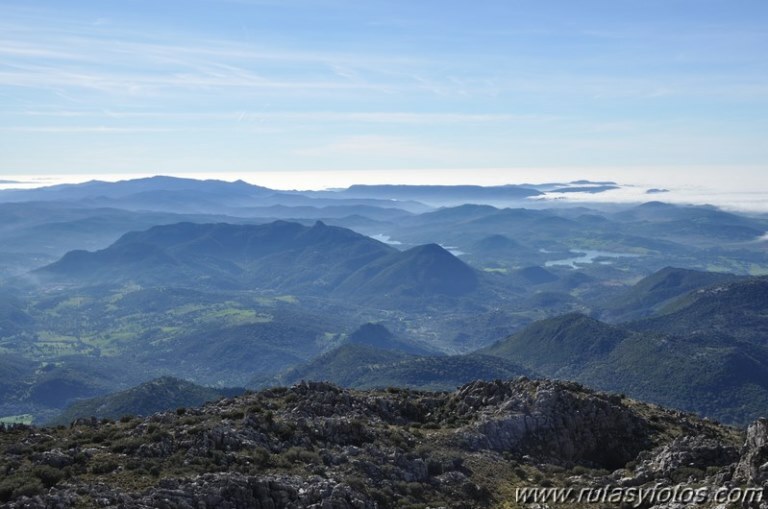 The Caldeira de Taburiente is an amazing place, a huge volcanic abyss with a horseshoe of thousand-metre cliffs falling into its deep ravine-riddled entrails. Twisted Canary pines cloak the lower hillsides and cling to impossible-looking cliffs. Far below are the fields and villages of the lower slopes, beyond them the endless North Atlantic. The history of the Caldeira is extraordinary (see our Caldeira de Taburiente page for more). There is a heroic selection of walking here. But the walk around the Caldeira rim, GR 131 or the Ruta de la Cresteria, is what every serious walker comes for, winding its way around all the pinnacles of this perfect semi-circle, from the great observatories at the north-west end to the Punta des Roques in the south-east, and on down the island's central spine, the Cumbre Nueva. This is some 25km of demanding walking, so many people break it down into sections. The first starts near the beautiful, sculpturally perfect, giant white puffball housing the Herschel Telescope at the Roque de Los Muchachos, and picks its way through the broken rock of the Caldeira edge, above cliffs approaching 2,000m deep, past the brilliantly coloured, twisted rocks at the Mirador de los Andenes, across the Pico de la Cruz, at 2,351m one of the highest points on the rim, before dropping from the beautiful Pico de la Nieve (2,240m; 7,400ft) down into the lovely forests of twisted Canary pines and pretty shrubs. The second leg climbs back up to the Pico de la Nieve, through the same pine forests with their floors of needles the colour of lightly toasted amber glowing in the dappled sunlight overtaken - when we were there - by drifts of crisp, pure snow. There was just one set of footprints along our path as we tramped, cautiously, over uncomfortable drops, requiring stamping of footholds for safety, but the sun playing on wisps of cloud among the trees was spellbinding. The path circles the back of the mountain before swinging to the right, up to the Pico and its wonderful panoramic view of the chasm and the back of the great mountain tumbling down to the inhabited foothills and then the smooth, impersonal sea. Further on round, you join the main track at the col to the south, which emerges quite suddenly at the brink of the Caldeira wall and a stupendous view down hundreds of sheer metres to the tiny pine trees, almost too small to be individually marked, and crazy pinnacles of the spines, ravines and great barrancos (canyons) of the Caldeira floor, to the narrow Barranco de las Angustas, where the bowl's rainfall escapes to the sea straight ahead. When we were there, cloud was coming up the cliffs and spilling out over the rim, and we saw... nothing, just thick, sinister cloud, its pale sepia tinge whispering of unfathomable horrors not far below. Occasional shredded gaps revealed giddy cliffs, dreary grey in the half-light but clearly waiting for the sun to reveal their fiery volcanic glories. It was reminiscent of the eerie chasms of the Huangshan in China. The path winds along the ridge, sometimes on the outside, with grand views out to sea, with Tenerife and La Gomera lurking on the horizon - if you are lucky - and at times within the crater, the void endlessly drawing your gaze, to your peril: a visual siren. 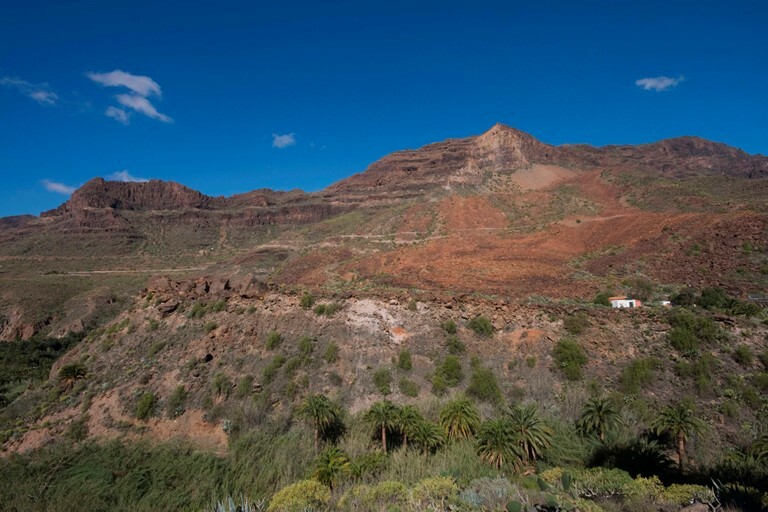 At the Degollada del Rio, the rim narrows to the detriment of one's stomach: it seems one is staring into the darkest recesses of hell on the caldeira side, and on the outside is the enormous, deep Barranco de la Hortelana. A tough pant up a crazed little peak - the air is only half as thick here as it is at sea level - is followed by further spectacular views, leading to the famous Punta de los Roques. Shortly after, you hit on a refuge, helpfully locked. From here the path descends from the long, high ridge down to the Cumbre Nueva, which divides the wetter, greener east of the island from the drier west and is often draped in spilling cloud in the mornings. The trail along this crest is a long, lovely but reasonably straightforward yomp. 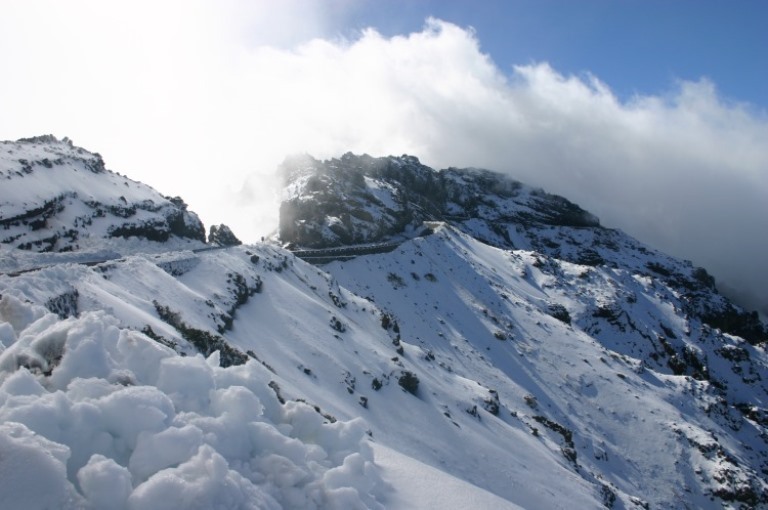 You will be tired but deeply contented when you reach the end at the Refugio del Pilar. 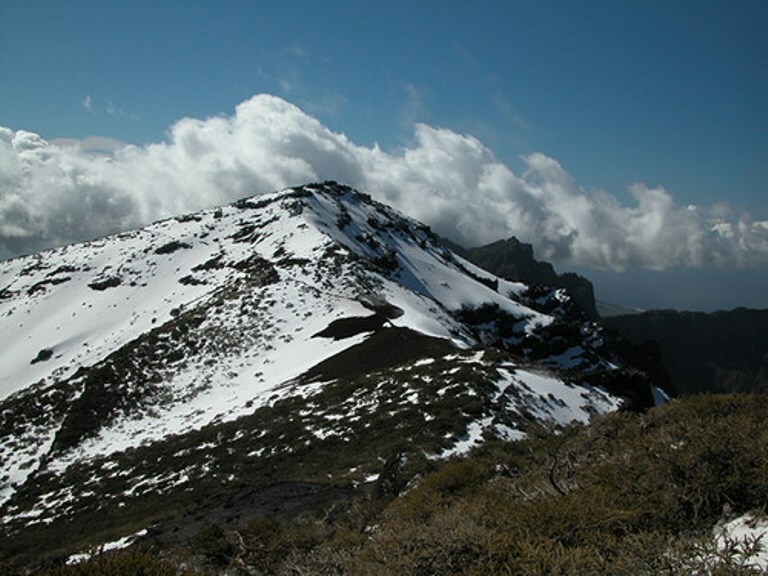 SEE OUR CALDEIRA DE TABURIENTE, GREAT VOLCANIC RIDGE AND LA PALMA PAGES FOR MORE INFORMATION AND OTHER WALKS ON THE ISLAND, FURTHER GENERAL AND PRACTICAL INFORMATION (INCLUDING SOME WARNINGS) AND PHOTOS.